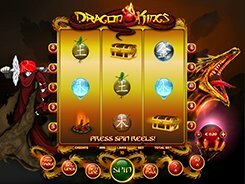 Dragon Kings is a 3-reel 10-payline video slot with the theme focused on Chinese mythology and dragons. Most regular symbols on the reels look like Christmas tree baubles or magic balls, with some Chinese hieroglyphs printed on them. 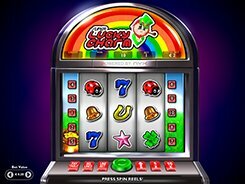 There are then some special icons that add to the fun factor: a scatter, Free Spins symbol and Bonus symbol. A player may adjust a coin denomination ($0.1 to $10), the number of coins per line (1 to 5), and the number of active paylines, thus the floor and ceiling stakes are $1 and $500, with all paylines enabled. The first and second jackpots you can win playing on the max bet are $5000 and $1500. 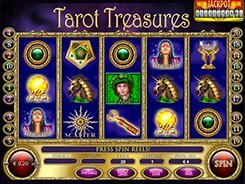 Hitting two or three swords across any payline triggers 2 or 4 free games that can be activated again from within the feature. Another great feature is a second-screen bonus game unlocked by two or three Bonfire symbols. During the bonus game you can win up to $5000. With eye-catching graphics, excellent awards and an exotic Chinese theme, Dragon Kings will definitely appeal to high-limit gamblers and 3-reel slot devotees alike. PLAY FOR REAL MONEY!